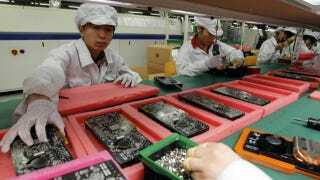 A reporter from the Shanghai Evening Post pretended to be a new worker at the Foxconn Tai Yuan factory to get an insider's look at how the factory is going to make the next iPhone 5. He spent a total of 10 days inside and spilled the undercover story of what goes on in the making of the next iPhone. We are told that if anyone enter or exit the metal detector door and found carrying any metallic stuff on your body such as belt buckle, ear rings, cameras, handset, mp3 players, the alarm will sound and you will be fired on the spot. One of my room mate told me that his friend has been fired because he carried an USB charging cable. It's serious business. In fact, the supervisors inside the factory constantly remind the workers that it's a privilege to build the iPhone 5, motivating them by showing off a new part and saying things like "this is the new unleashed iPhone 5 back plate, you should be honored having the chance to produce it". But the work is terribly, horribly, awfully mundane.